Paddy Slattery's debut feature film, produced by Simon Doyle (FailSafe Films) and Paddy Slattery (True Line Films) is currently shooting in and around Dublin this month. Post-production will follow in September with the intention of targeting film festivals and a distribution deal in Ireland and aboard. 'Let Your Guard Down' was independently financed with a share of the budget raised on the crowdfunding platform Indiegogo. The film's synopsis - Dave Connolly is a respected member of the Garda Síochána but his loyalty to the law gets tested by his ex-convict brother Joe who is in desperate need of his help. Paddy Slattery told IFTN, "It's a dream come true directing a feature film surrounded by an extremely talented cast and crew. Of course I'm anxious about the outcome of our work because of the financial restrictions we are facing but I'm also extremely confident that we'll make a film we can all be proud of." 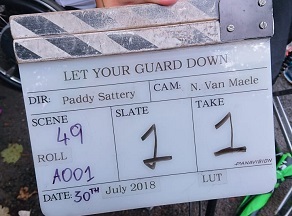 Producer Simon Doyle told IFTN, "Paddy's a great director with a fantastic cast and crew behind him so we're really excited to get this film in the can."